Last week, from March 23-25, 2011 were amongst the 3 most important and exciting days for anyone remotely connected with Microsoft technologies. They were the days when the Tech-Ed 2011 (India) was hosted by Microsoft at the Lalit Ashoka Hotel in Bengaluru, Karnataka. Through the next couple of posts, I will be sharing with you my experience on the wonderful time I had at the Tech-Ed event. Tech-Ed 2011 began by the registration of what I believe to be a crowd of at least 3000 participants. Once the registration was complete, we all started to proceed towards the main keynote area for the keynotes. On Day 01, we were lucky to have keynotes from esteemed leaders like Mr. Qi Lu, President, Microsoft’s Online Services Division and Mr. Yousef Khalidi a Distinguished Engineer (Windows Azure) at Microsoft. Opening his keynote session, Mr. Qi Lu appreciated India’s IT workforce as the world’s 2nd largest developer ecosystem. His session was focused on how this developer ecosystem can contribute to the making of a new web and how Microsoft’s online division is working towards this goal by developing new ways to interact and providing intelligence through services. He introduced the concept of the consumer cloud – one that is an online service which can understand user intent using natural user interfaces like the Microsoft Kinect to enable task completion by local commerce and personal relevance. He demonstrated how Microsoft’s Bing has the vision to usher in a new cloud organizing paradigm by combining the Web of pages and the Web of people for better target-ability, measurability and predictability of the search results. Mr. Yousef Khalidi focused on how we have grown and come almost a full circle as we moved from centralized, thin clients to distributed computers and now on to large data centers running scaled-out commodity hardware. He explained how Windows Azure is an example of Platform-as-a-Service (PaaS). However, the best take-away from his session was the definition of a “cloud” – A cloud is a style of computing provided as a service over the Internet using dynamically scalable, virtualized hardware and resources. By the end of the session, I was left with great surprise for Windows Azure after learning that prime-time applications like Windows Gaming, Bing Twitter, Docs.com and Microsoft Hohm use Windows Azure. After the lunch at the pool-side (being at a Microsoft event has it’s benefits), it was time for the power-packed break-out sessions. The first of these sessions was from Vinod Kumar (blog) on the ““Unexplained” of SQL Server Security”. Vinod demonstrated the secure SQL Server login process using the Microsoft’s Network Monitoring tool (download here). He showed the audience that not for a single handshake is the user password being exchanged over the wire. Later, he took the audience for a deep dive into SQL Server security by demonstrating how permissions can be restricted to a particular group of columns in a table to restrict the user of SELECT * and how one can use Policy Management to implement SQL Server security. He also demonstrated how auditing can be made secure and system provided an ability to detect an attempt to intrude via impersonation by the use of SQL Server certificates. After the tea break, we had a wonderful session on the worst T-SQL practices by none other than our very own SQL Server MVP – Mr. Jacob Sebastian! The hall was packed with more than 200 attendees, and everyone participated whole-heartedly as Jacob ran through some of the most common T-SQL worst practices that he has seen in T-SQL code over the years. Everyone in the hall was, I am sure, recalling the various lines of code that they would need to go back and change as soon as they resumed office on Monday! Jacob highlighted the various performance and computational issues that might arise due to a simple slip of the mind on account of the developer attempting to finish off a task in a hurry. The session has left such an impression that I will, for my record, be writing a detailed post on the various points highlighted by Jacob. Stay tuned! After Jacob’s session, it was a once-in-a-lifetime opportunity for all present in the hall at the time as Mr. Prem Mehra, a program manager with the SQLCAT (SQL Customer Advisory Team – http://sqlcat.com) at Microsoft in Redmond stepped up on stage. The honourable Mr. Mehra has over 49 years of experience in the IT industry, and it was simply mesmerizing to watch him talk about some of “The Largest, Mission-Critical Deployments of Microsoft SQL Server around the world!” He talked about some SQL Server deployments spanning leading US insurance providers, health-care organizations, financial institutions, banks and betting web-sites. During the session, someone asked Mr. Mehra a question regarding the comparison of Microsoft SQL Server with the competition in terms of scalability, high availability and reliability. In response, Mr. Mehra simply presented the following slide and left the audience to judge for themselves. 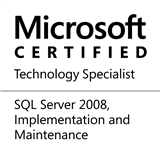 For me, it was a proof of something I have always believed – the product we love, Microsoft SQL Server, is simply the best! Closing time – Demo Extravaganza! As the evening set in, it was time to end the day on an action-packed, excited note. We gathered back into the main keynote hall, where we had a half hour of the most electrifying demos – all completed in less than 3 minutes each! What a magical atmosphere had been created – almost as if it was Hogwarts and Harry Potter himself was presenting! Stay tuned for a detailed account of excitement on Tech-Ed 2011 (India) Day 02! This entry was posted in #SQLServer, Blog, Imported from BeyondRelational and tagged #SQLServer on March 28, 2011 by nakulvachhrajani.